POP FROM ALL ANGLES: Churrasco! This was my "weekend" on Facebook. Showing the world of "friends" what they were missing. Namely, a "real" Brasilian Churrasco. The way I remember it on the tiny street in Rio, at the guy's driveway, with the stone grill, feeding us beer and "soap operas." Believe me, I've tried this many times -- ever since my first churrasco in Uruguay -- and it has never ended in such a feast. Though the fancy steakhouse version of churrasco in Brasil is often a pale specter of that glutton in America. I owe most of my successful night to my Pittsburgh friend, Thiago (a true man of Brasil). He handled the knife, I worked on my "tony bourdain"-ish, wanderlust, marinades. I'm going to try to re-create here for your use -- can easily be acheived on a small 12" gas grill, in a-la-carte, more than you can eat, firing sessions. Keep in mind we did not have/could not find blood sausage, chicken hearts, or farofa/farina. But those nights in Rio, we didn't have any of the above. (If you can recommend a butcher that still sells hearts, please let me know). The caveat of a true churrasco is the salt. What you coat it with right before the fire. I'm fortunate enough to have a half-cup of the finest churrasco salt containing -- rock sea salt, calbrese (sausage seasoning), dried garlic, white pepper, and other secret spices -- to rain on the mountain of meat we'd created. In Rio it's all about sticks. How many you've had? Which were the best? By the end of the parade of meat is comparable to finishing the best filet you've ever consumed. The best seafood meal in your life. It's actually kind of more than that. A communal happening. The social aspect makes all taste extravagant. Or there's nothing like minimal meat? 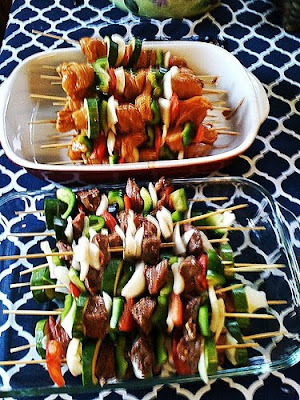 I've always made a variation -- Spicy Meat -- which marinates steak stick in Green Tabasco, cayenne pepper, Sriracha, and fresh jalapenos. It always works. Poolside with Jane Wiedlin's "Rush Hour"